Remember the UK's first cat café in Totnes? Well, the cats and café have relocated to a countryside location near Newton Abbot! My name is Frazzle and I would like to introduce you to my special café lounge, where a team of cats and a number of human servants are waiting to meet you. Everyone here is ready to make sure that your visit to my lounge will be as enjoyable as possible. When I am feeling a distinctly frazzled Frazzle, then a short time in the café lounge soon smooths my fur, straightens my whiskers and leaves me feeling sleek, relaxed and purrfectly content. If you are feeling somewhat frazzled then in no time at all the company of the café cats will soothe and relax you. 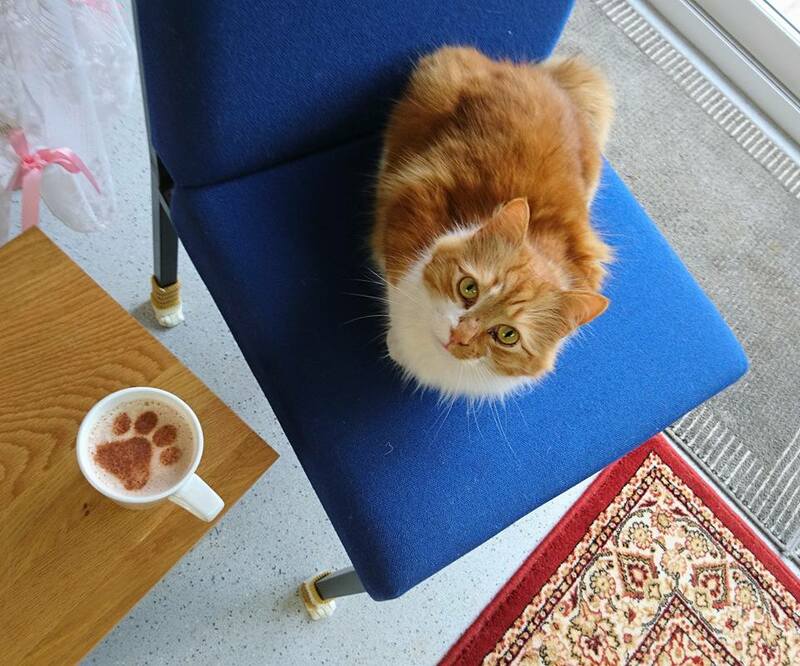 The Cat Café is open to adults and teenagers over the age of 16. Unfortunately we are unable to admit children under the age of 16 years old to the café. 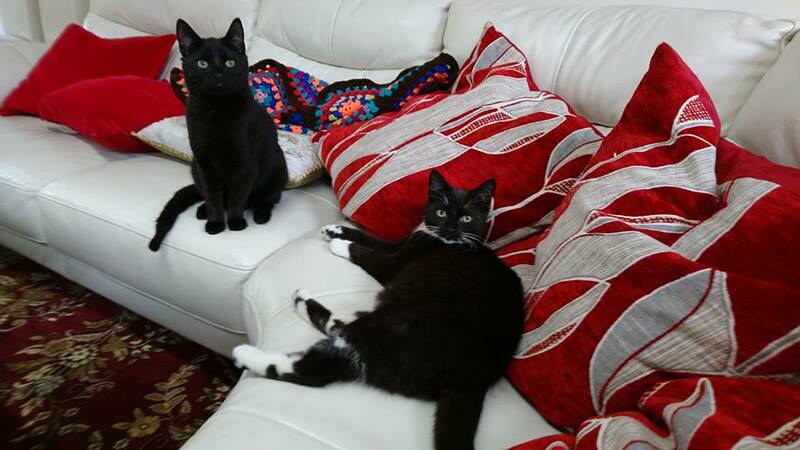 All our cats, who were previously adopted from a cat rescue centre, have been carefully chosen to ensure that they are suited to a cat café environment. Not all cats would be happy in such a setting but our feline team enjoy the experience. 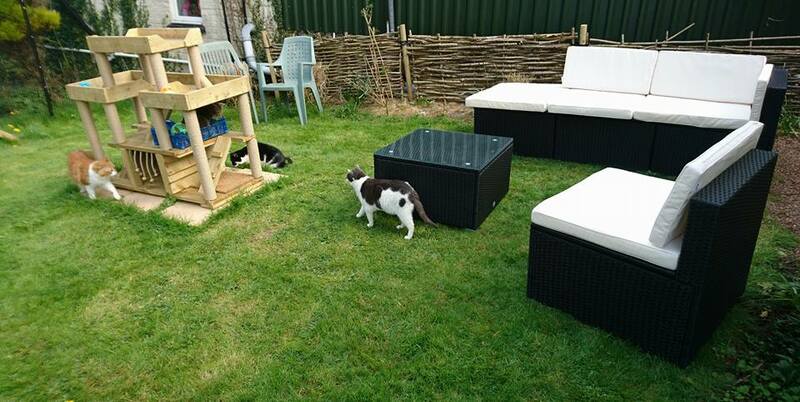 Our cat café is a large lounge and garden, on the site of the home of the cats. 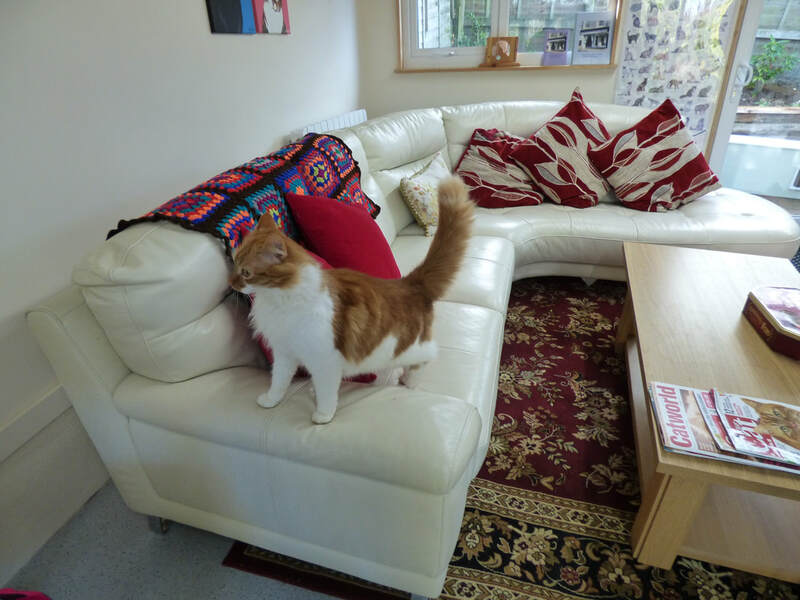 The cats treat it as an extension of their home and are relaxed and happy there.They are also experienced cats as they were the ones who hosted the Totnes Cat Café. Click here to find out How it all began. All the cats will love to meet you. Some will come up to you as soon as you sit down, some will inspect you from a distance first, some will want to play, others will want to be stroked. Some will sit on your lap, others will sit beside you. It all depends on the cat and, just like humans, how they are feeling on the day. If any of the cats are alseep, then please do not disturb them. Our cats prefer not to be picked up. The human servants love to chat about cats (theirs, yours, others, in fact any cats and cat related matters!) and will be happy to answer any questions you have about the café and the cats. They will also serve you refreshments (the café cats are adamant that serving drinks is a human servants' job, not a cat's!). Our café has a 5 star Food Hygiene Rating from the Food Standards Agency. Our cat café is not for profit, and all proceeds will go towards developing and expanding the facilities for Mitzi's Kitty Corner Cat Rescue. We do not have a card machine at the cafe so only accept cash (or cheque) payment for drinks etc. I am sure you will enjoy your visit. Click here to book. Booking is recommended to ensure a seat. Booking fee: £4 per person. For those who haven't booked there is an admission fee of £4 (cash only, no cards taken), payable on arrival. If you are a carer who regularly brings the person you care for, or a regular visitor to the cafe, please message/email us for more information. Our cat cafe is not for profit, and all proceeds will go towards developing and expanding the facilities for Mitzi's Kitty Corner Cat Rescue. Booking fee: £4 per person. For those who haven't booked there is an admission fee of £4 (cash only, no cards taken), payable on arrival. If you are a carer who regularly brings the person you care for, or a regular visitor to the cafe, please message/email us for more information.